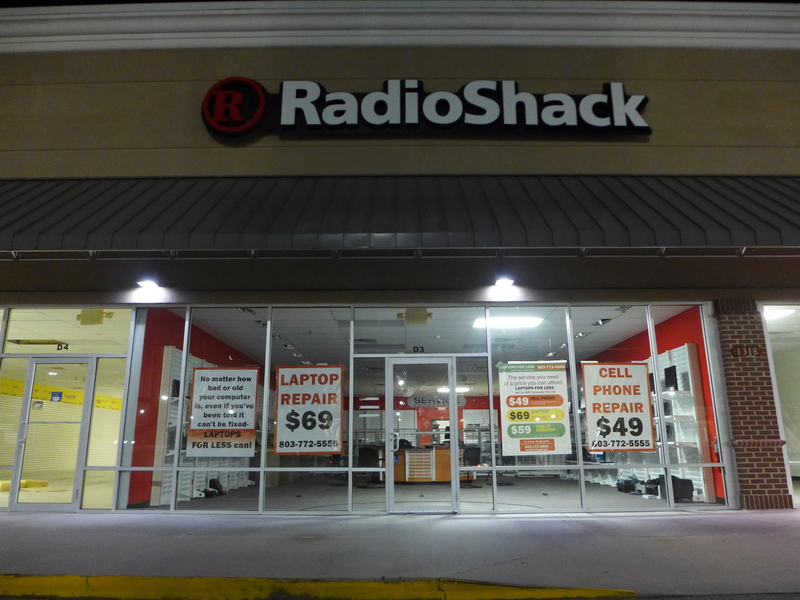 I was not familiar with this place, but apparently this store was the only Apple authorized repair location in town. 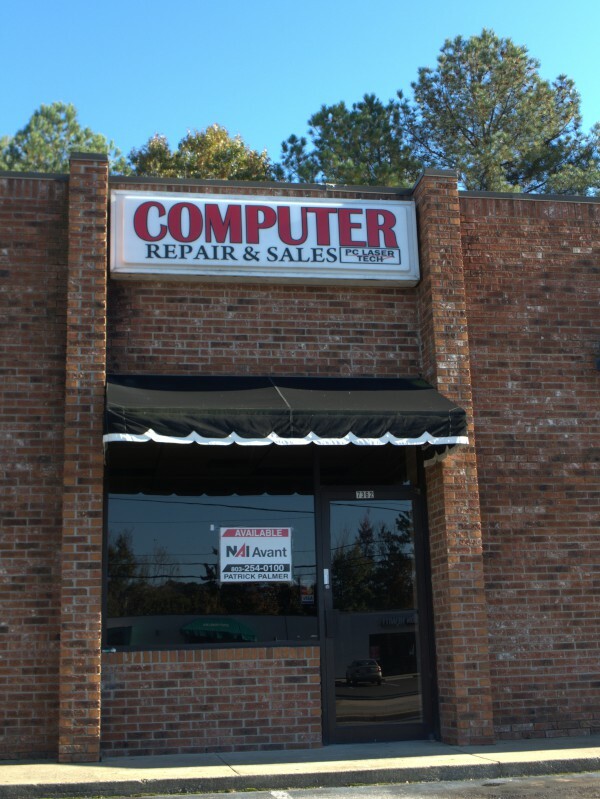 My experience as a computer guy is that Mac stuff is great until it stops working, then it's a real pain to get working again. 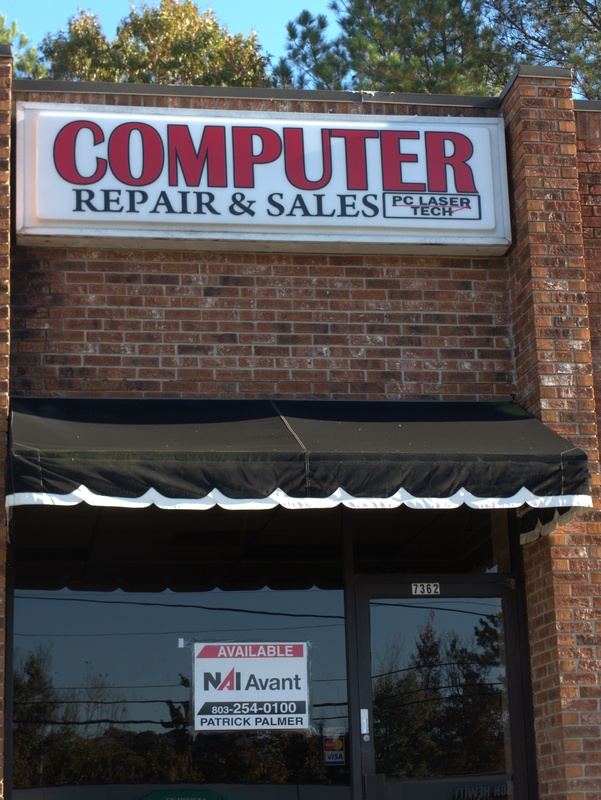 Granted this impression comes mainly from the software side where everything was so "easy to use" that there were never any diagnostic knobs to tweak, but there you go..
Commenter Matt reports a new Apple repair location on Taylor Street. 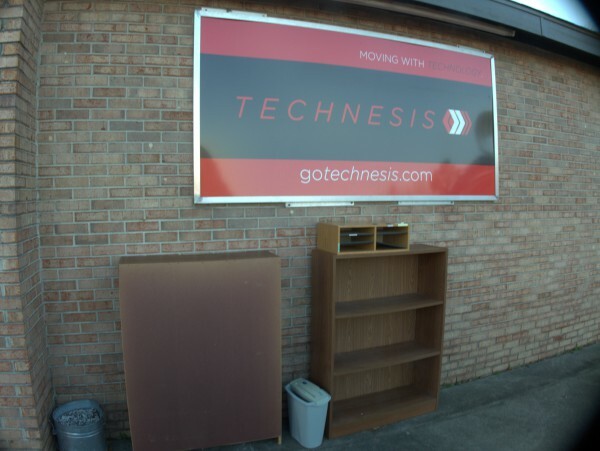 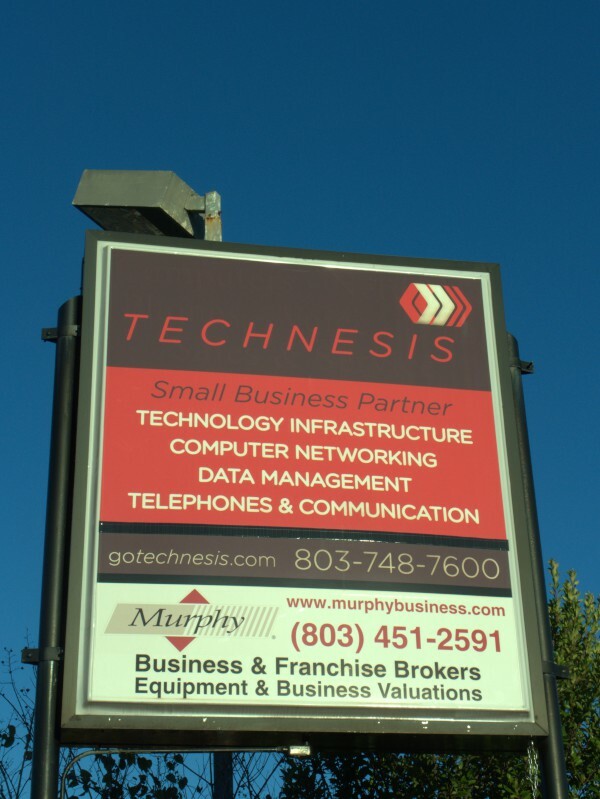 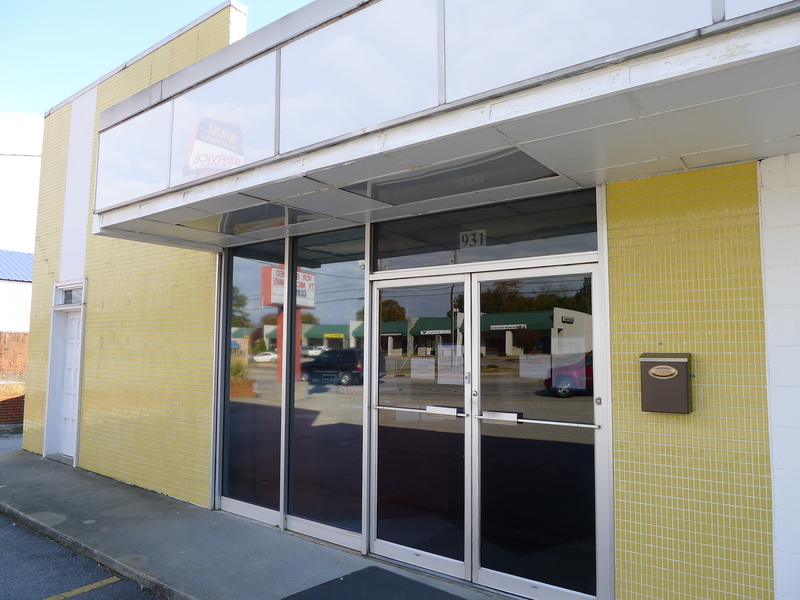 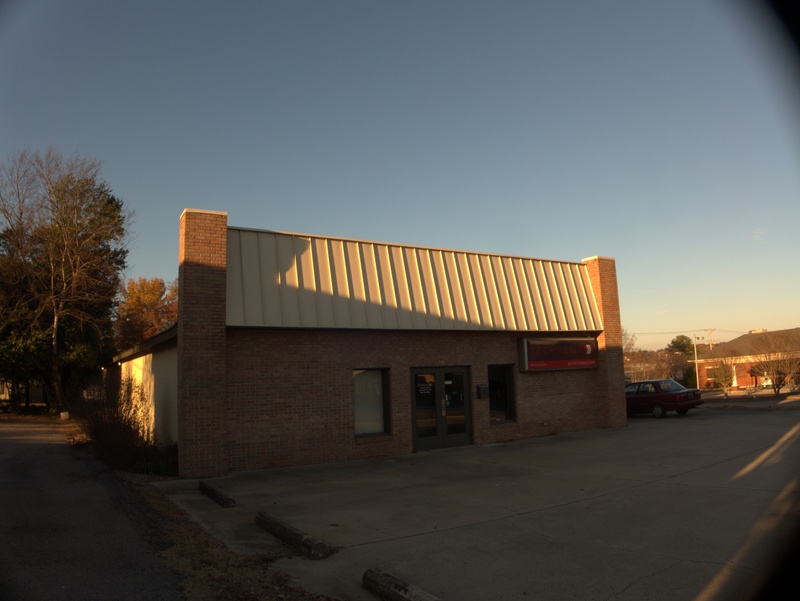 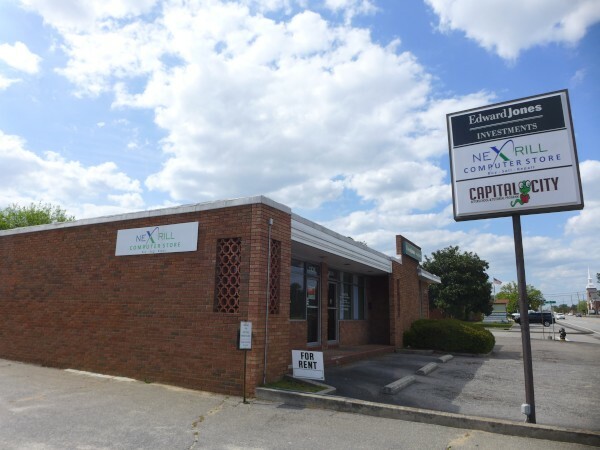 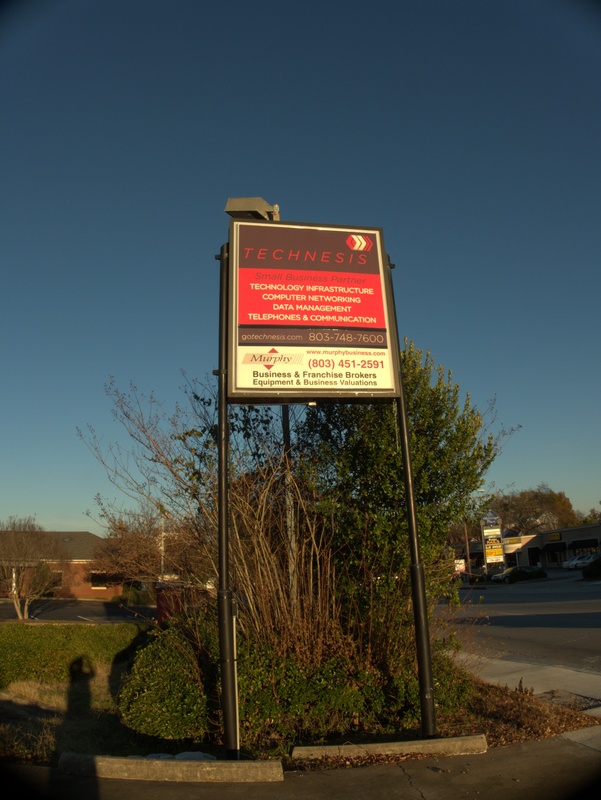 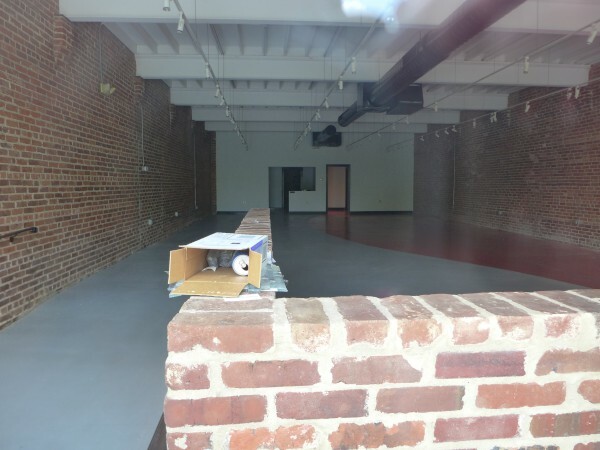 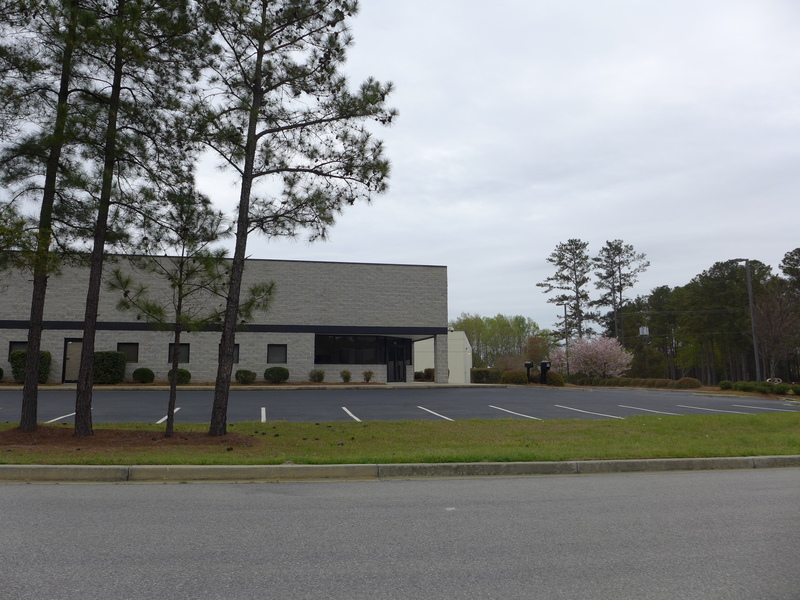 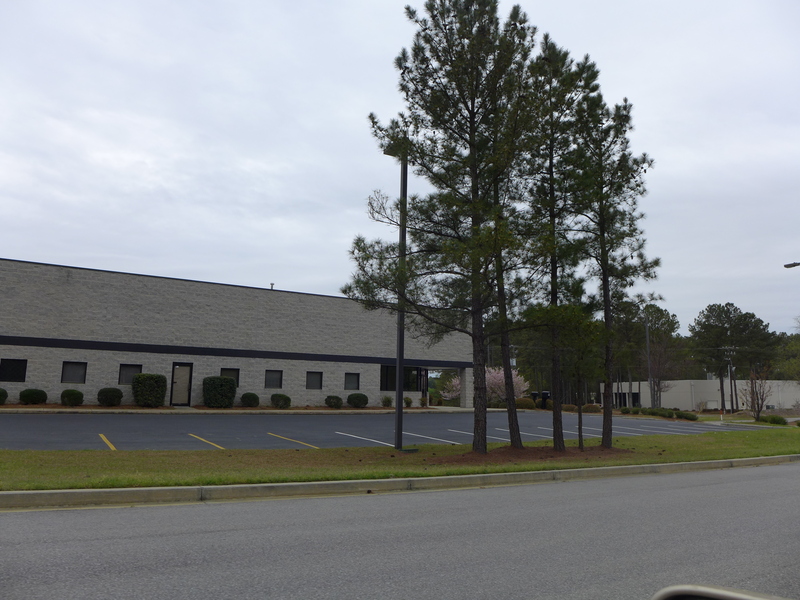 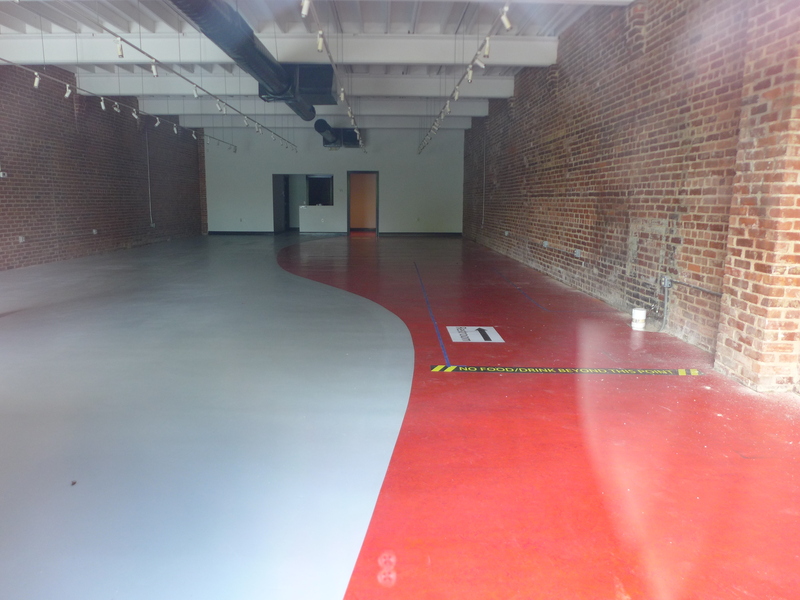 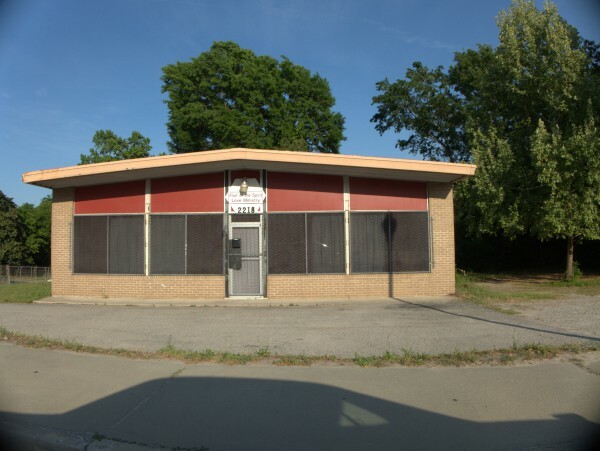 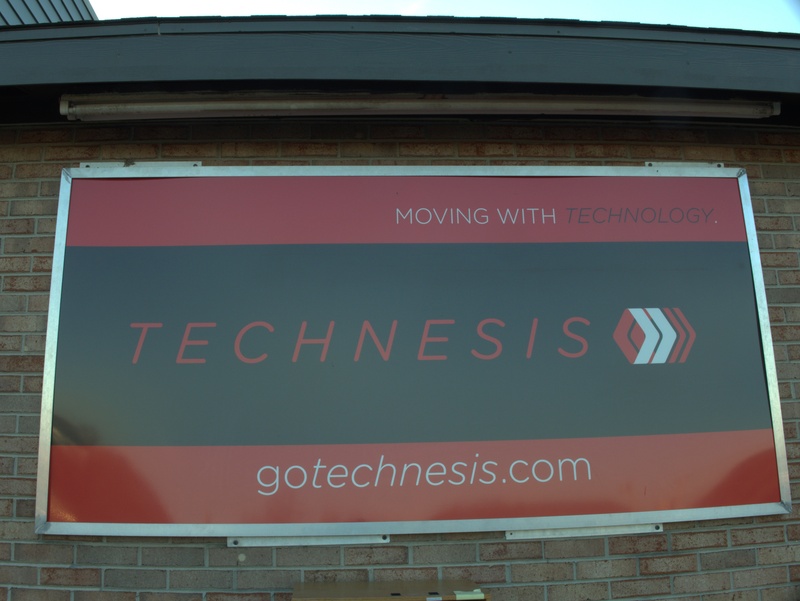 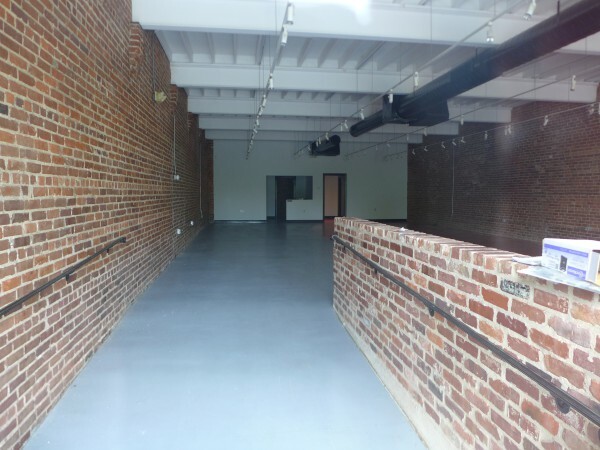 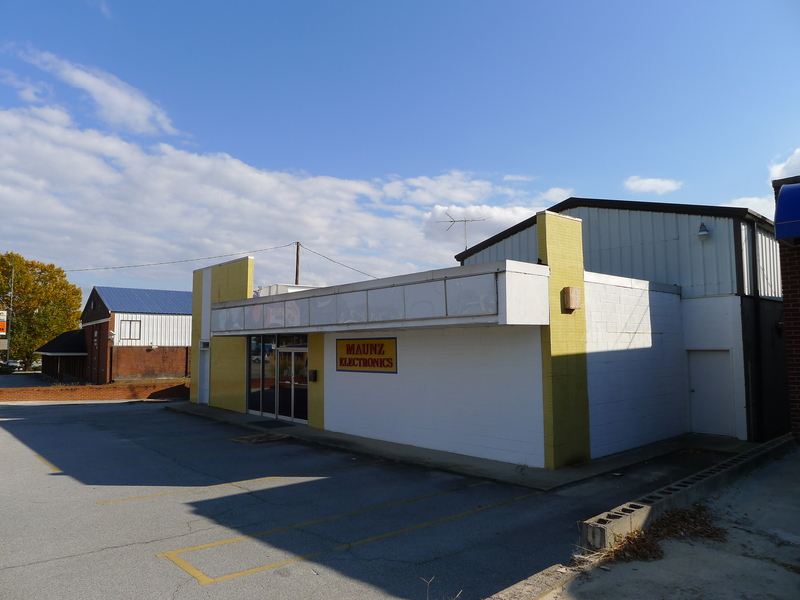 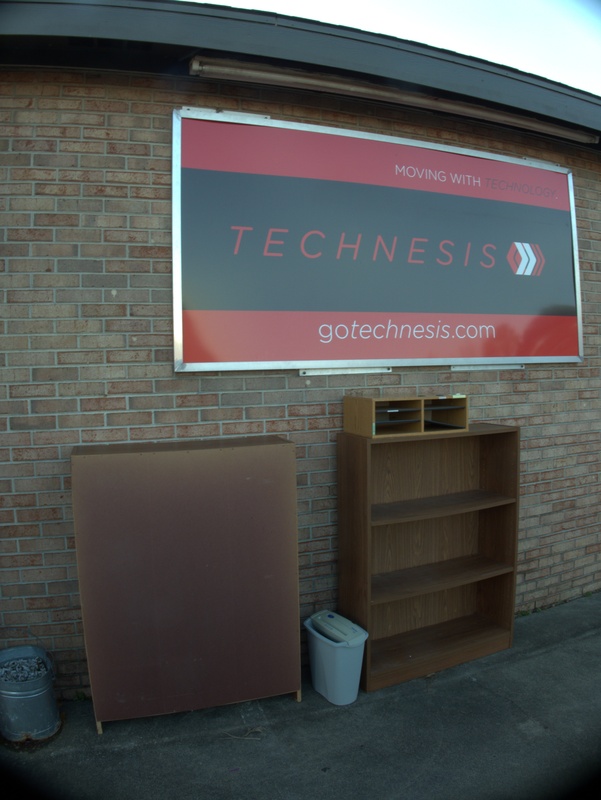 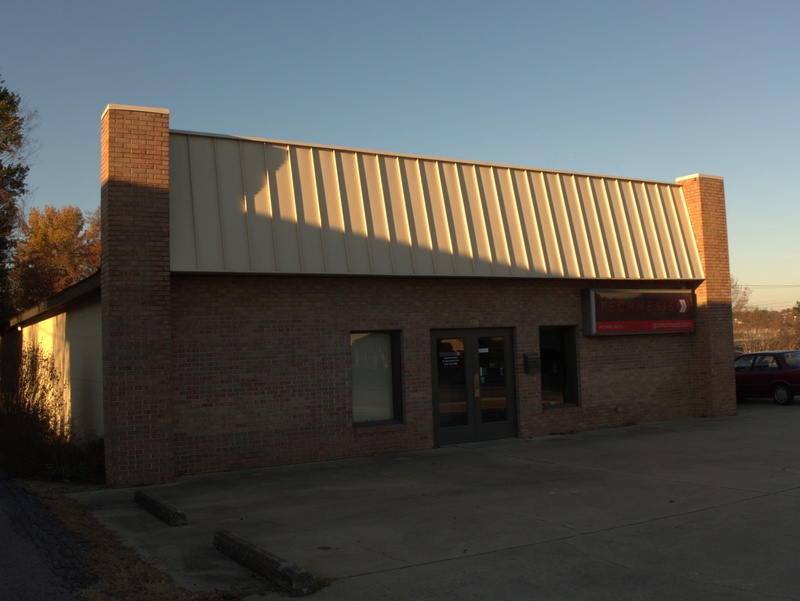 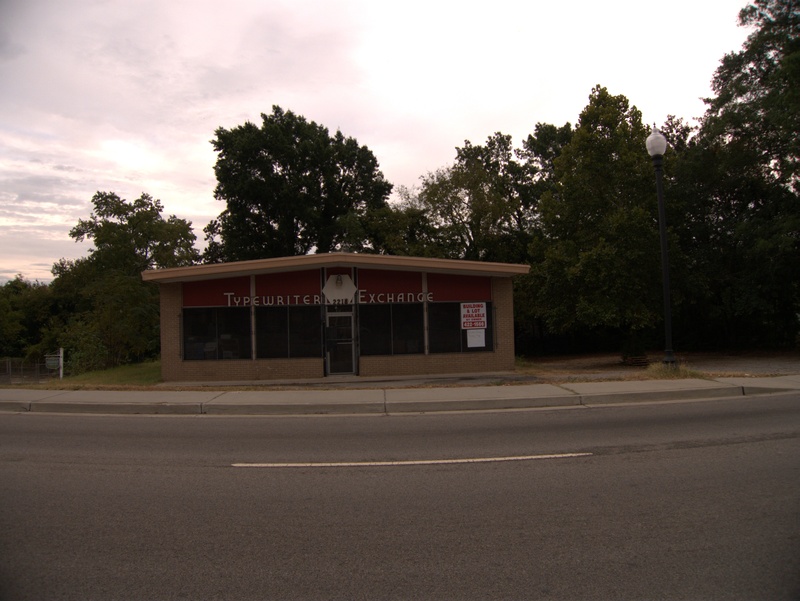 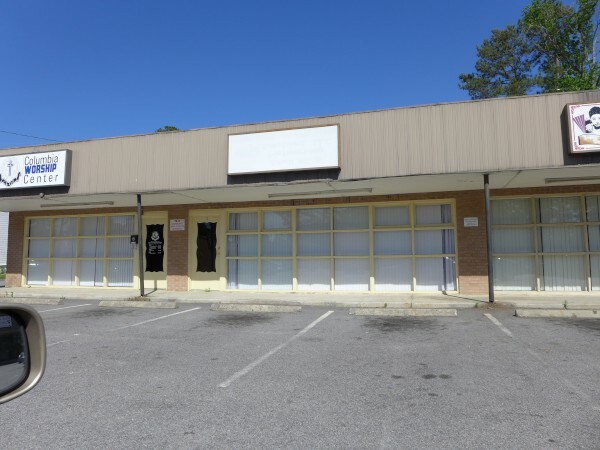 Technesis at 536 Meeting St in West Columbia has closed. 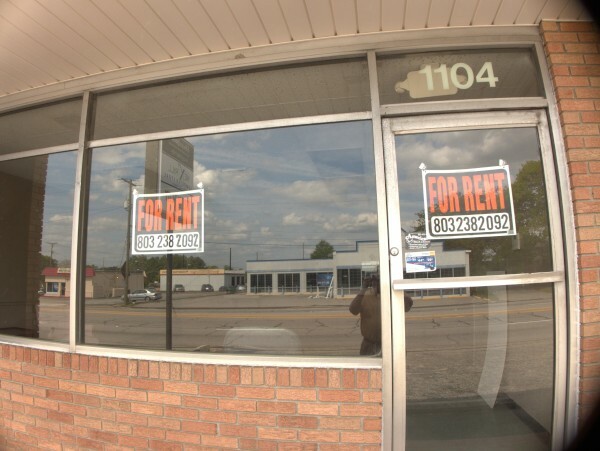 This was the followup operation to Microprice around 2010. 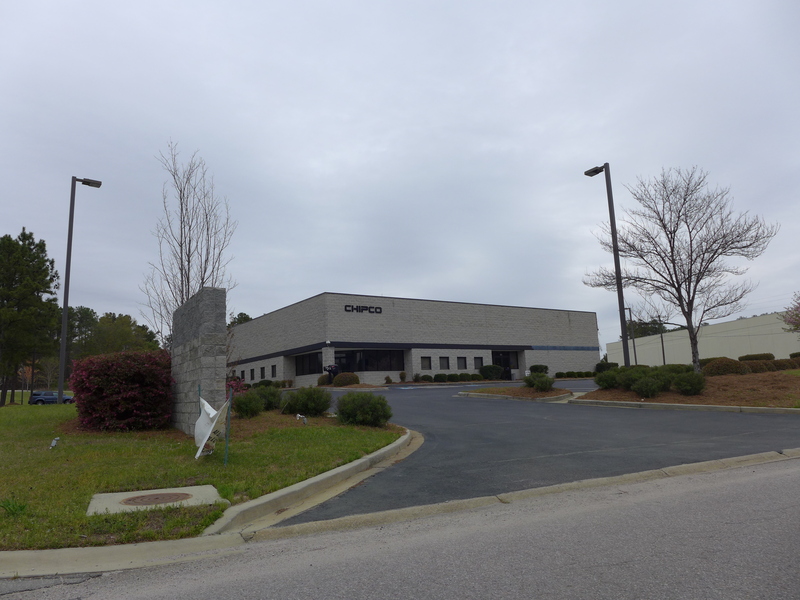 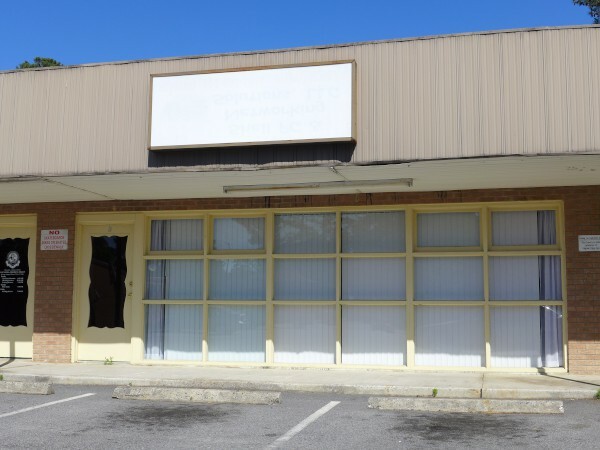 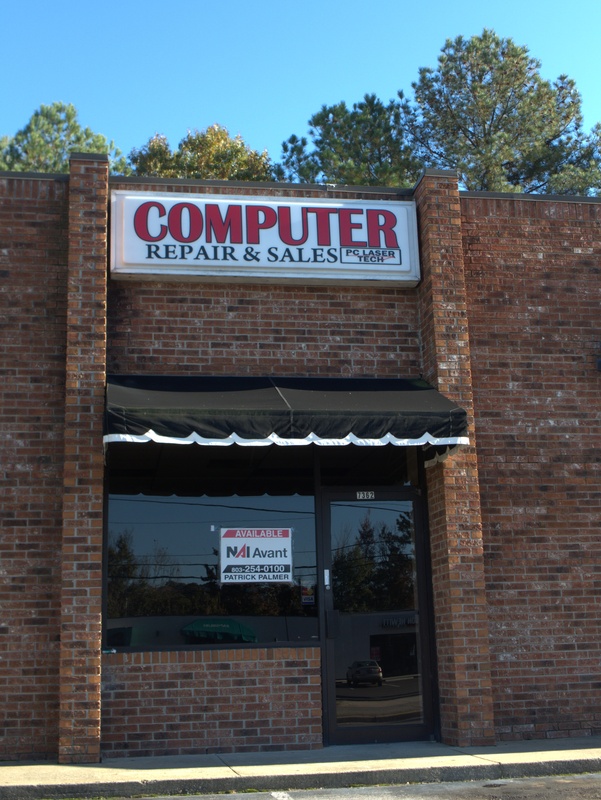 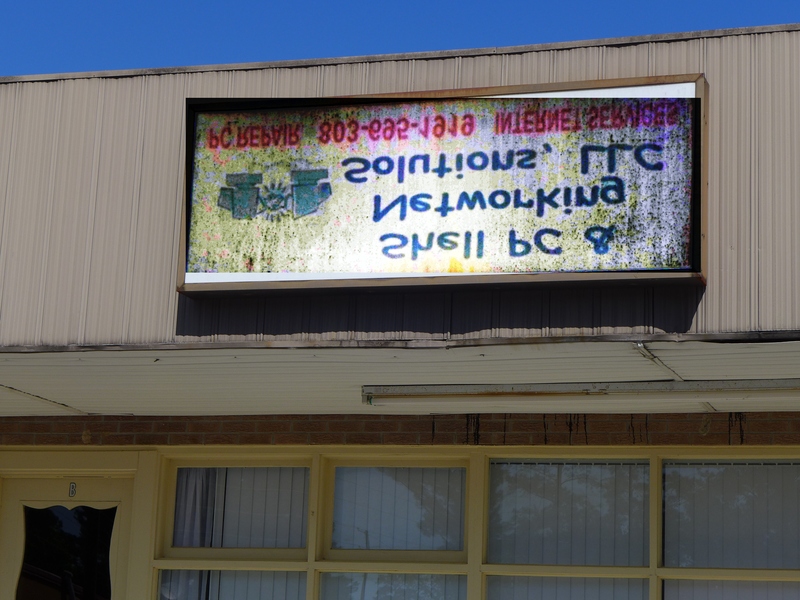 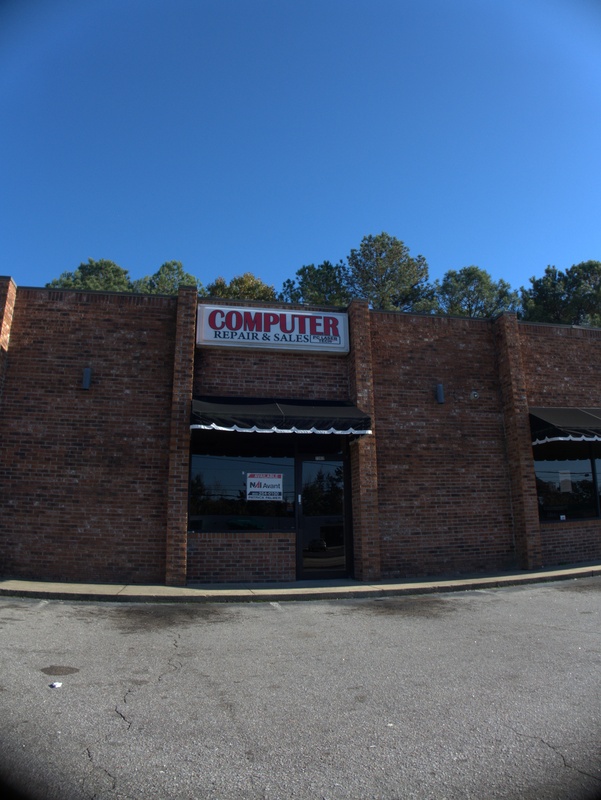 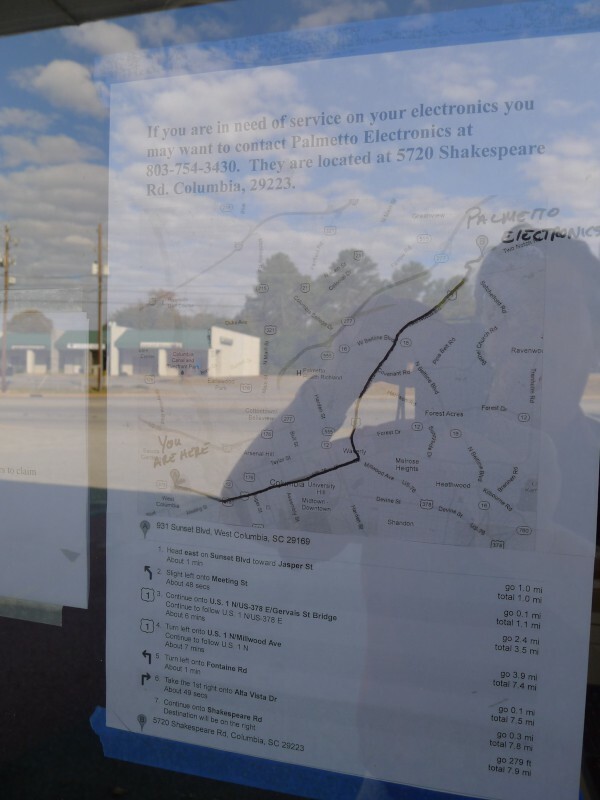 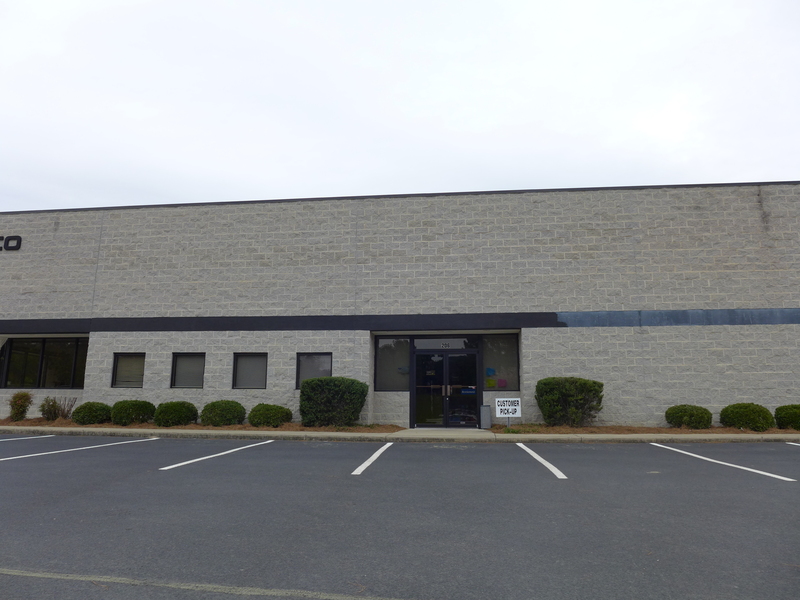 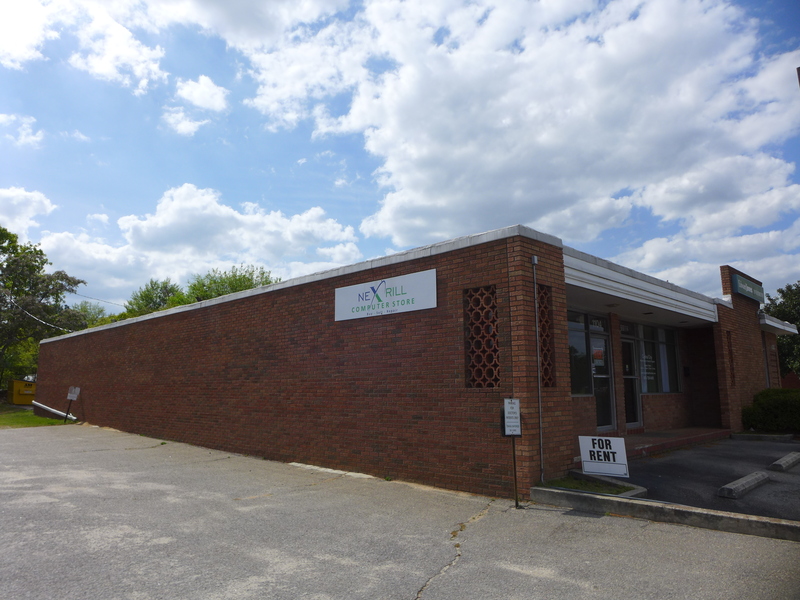 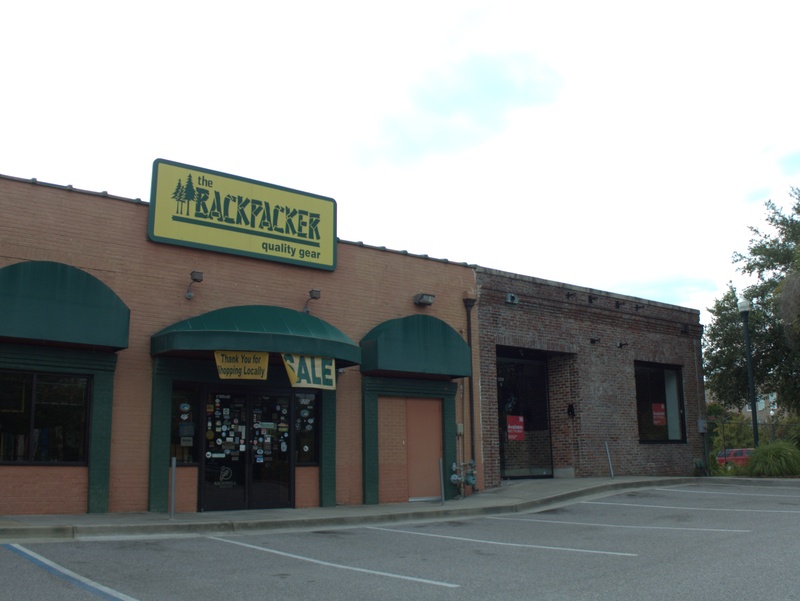 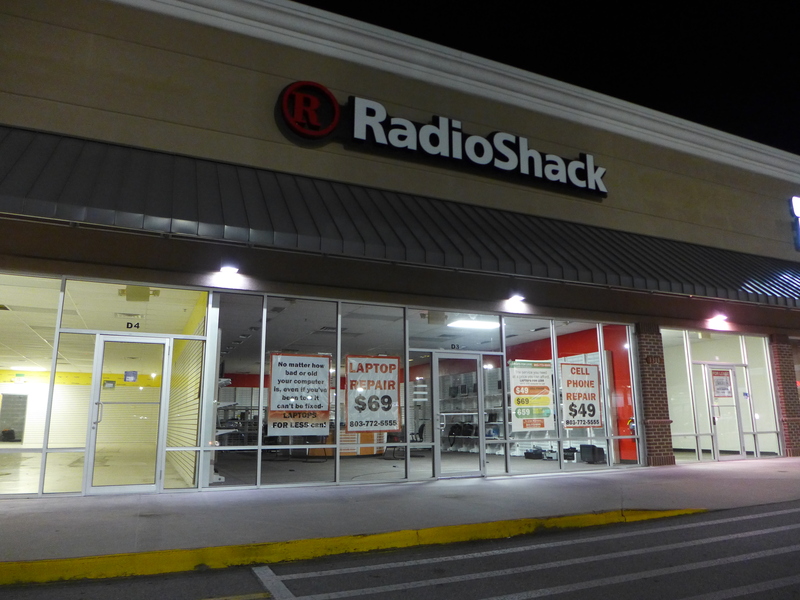 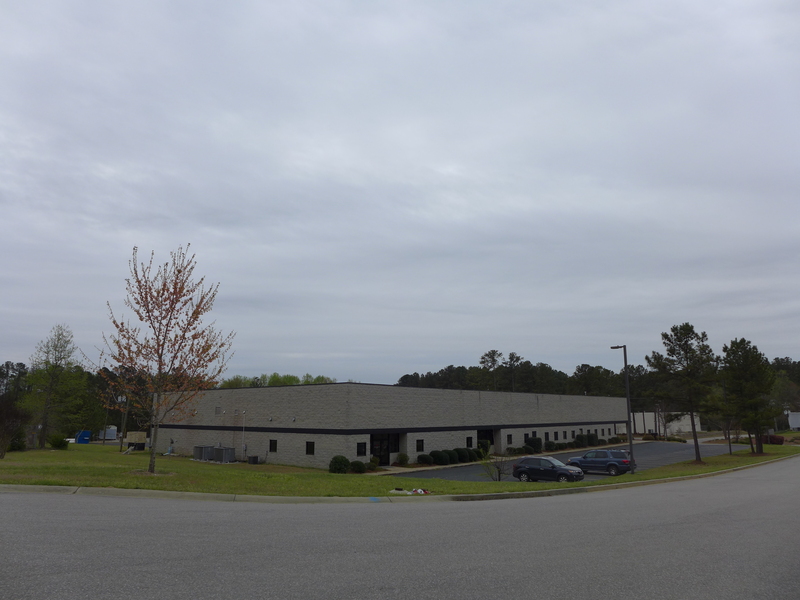 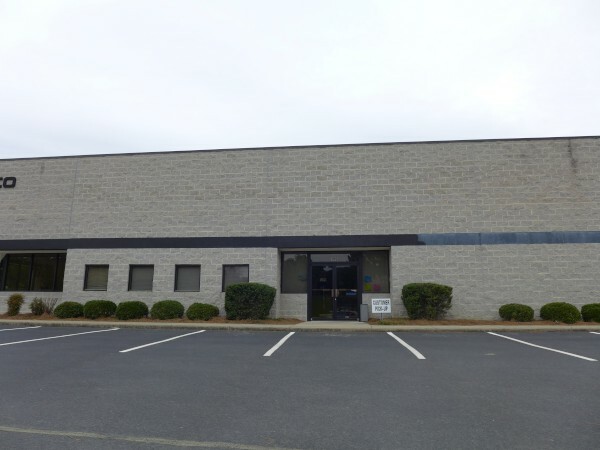 The owner sold the customers to another IT company out of Charlotte and closed the doors. 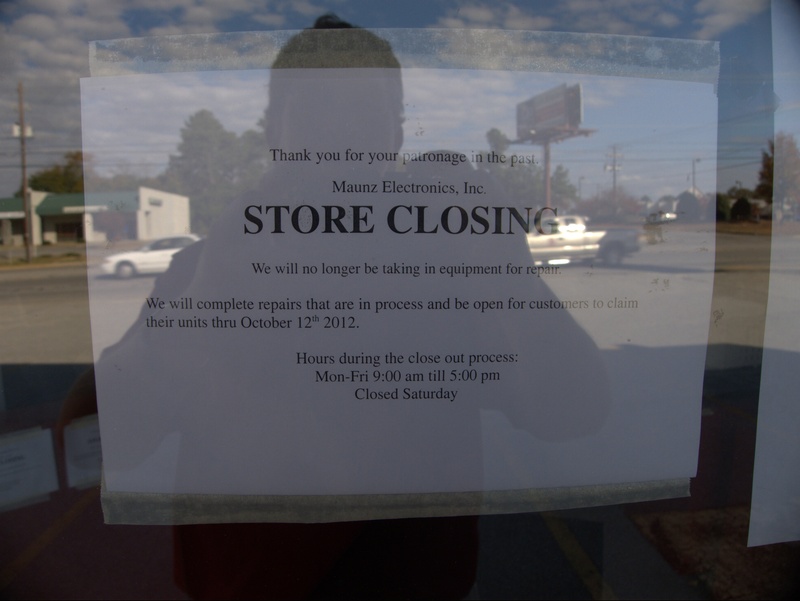 It is nice that the customers were taken care of in the closing. 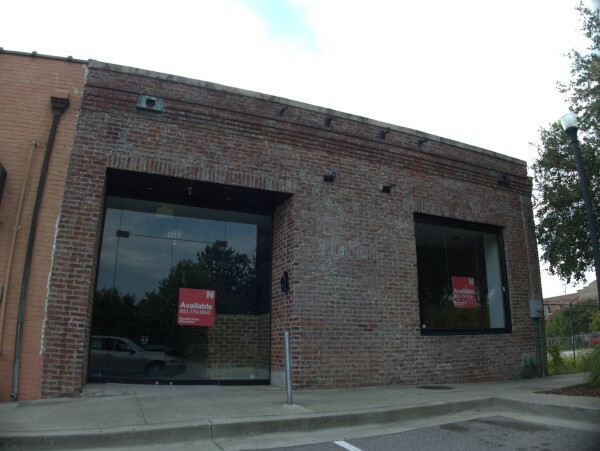 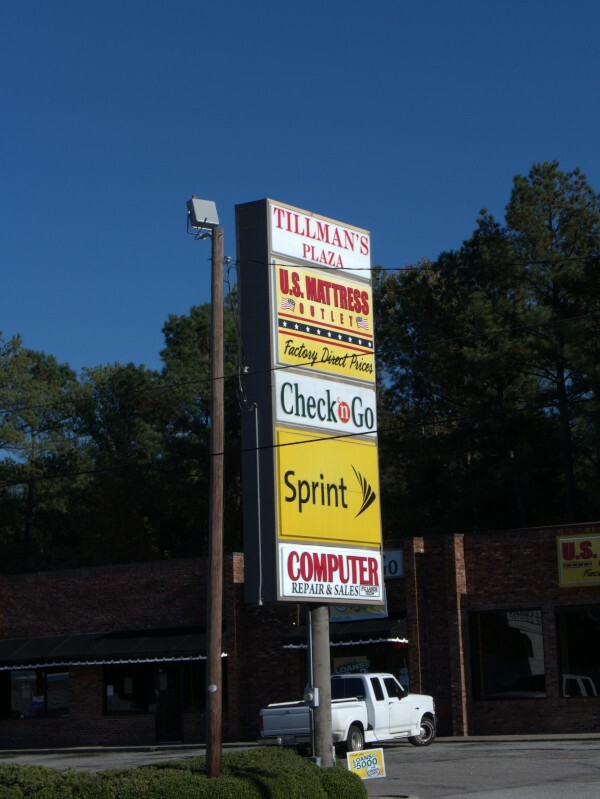 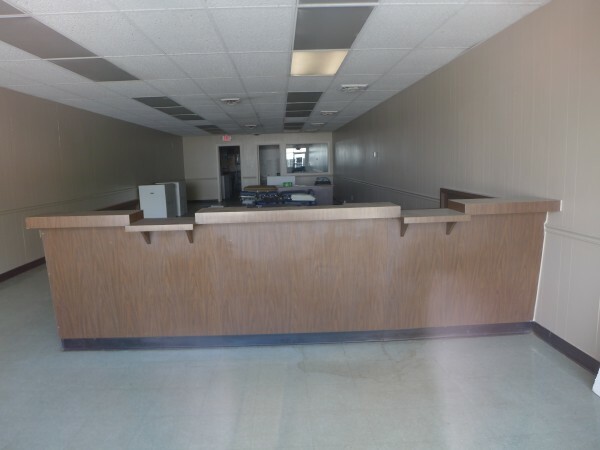 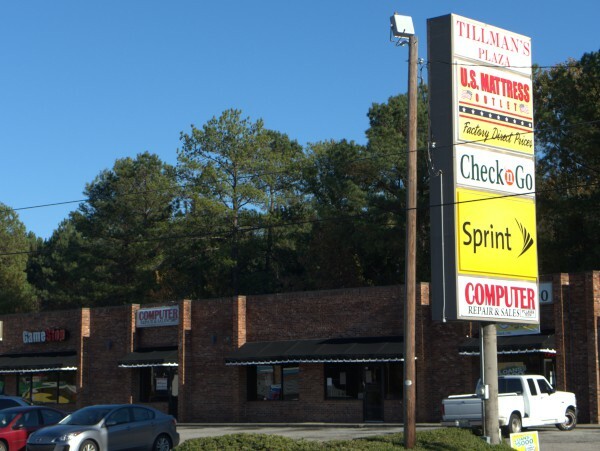 Here's another vacant storefront in Tillman's Plaza on Two Notch. 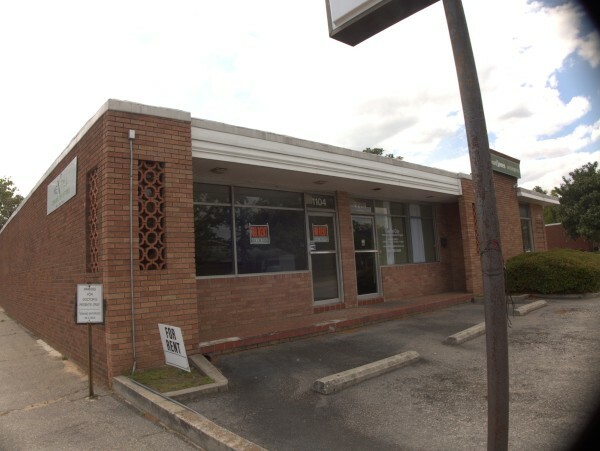 I happened to glace across the street as I was at Kinko's, printing some documents and noticed it was gone. 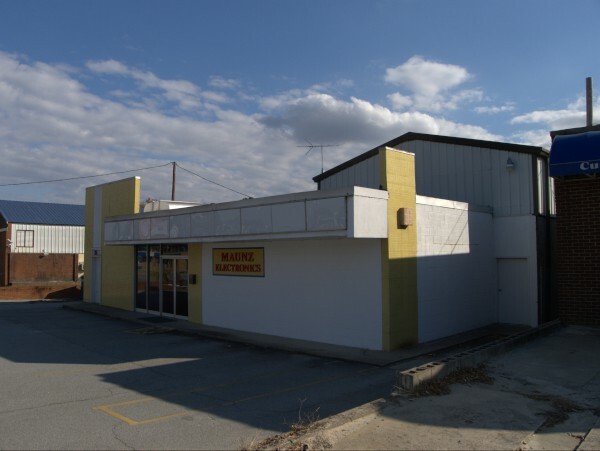 OK then -- based on phonebooks, it looks like Shell PC & Networking Solutions probably closed shop in 2010. I would never go back to one, but there is something magical about a typewriter: the rhythm of the keys, the ding of the bell, the tactile sensation of the platten ratchet advancing while you slap the carriage back over.. 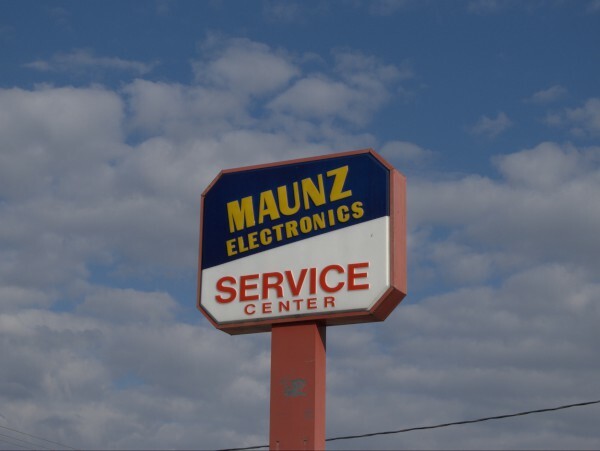 Even the smell of one is distinctive, a unique combination of metal, stale air, oil and ink. 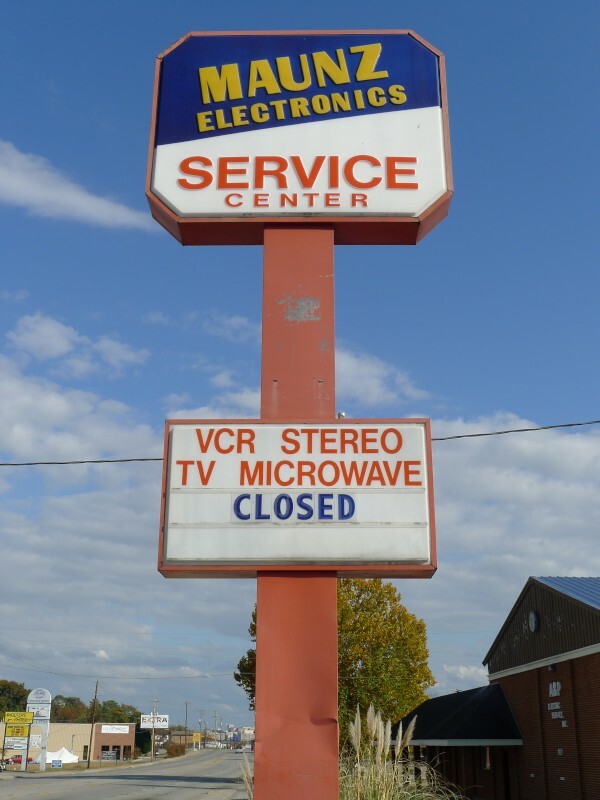 And for something ubiquitous so recently there are few other things (the phonograph is one..) that illustrate the generational divide so clearly. 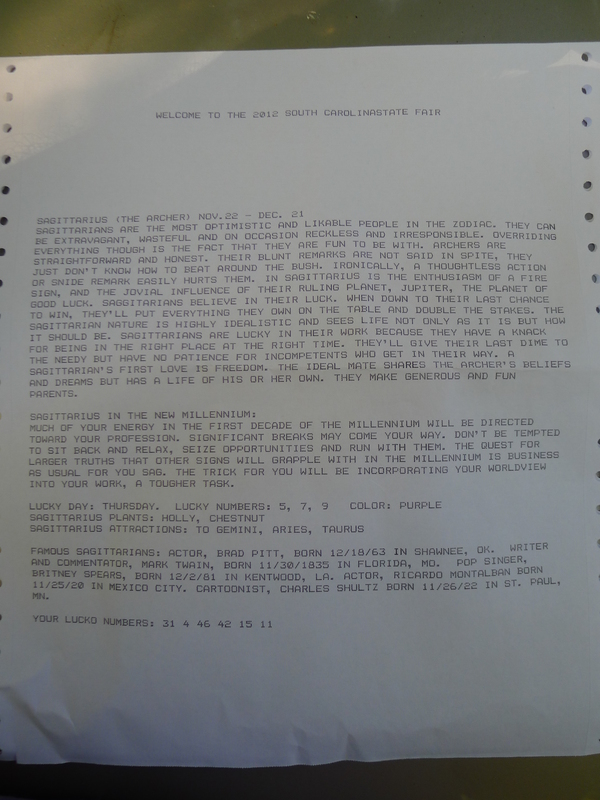 Set a high school student in front of a typewriter today, and you might as well have supplied a blank cuneiform tablet and chisels. 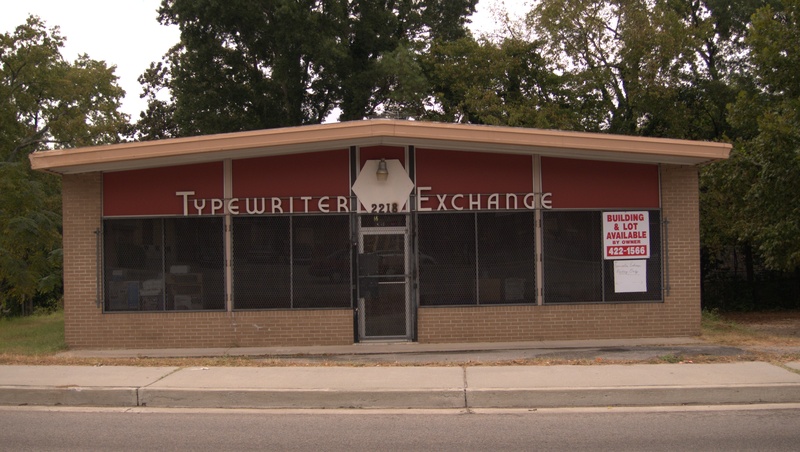 The Typewriter Exchange had been on Two Notch for as long as I can remember, probably going back into the '60s. I often wondered in recent years how they continued on, but a look through their window suggested they had moved into computer repair as typewriters became paperweights. 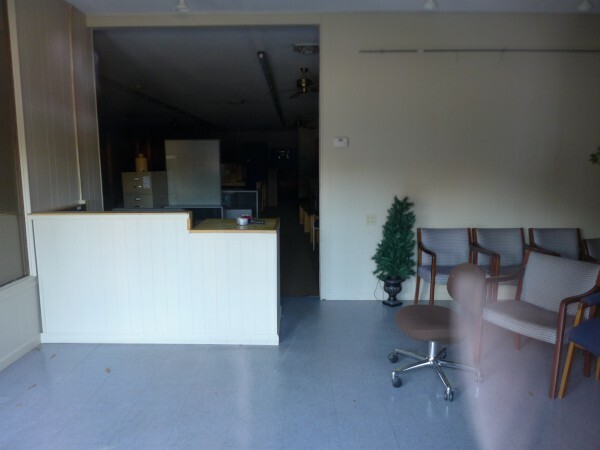 Although the building had been up for sale since at least 2010, the business continued until recently, but last time I drove by, I noticed the place is now a church. 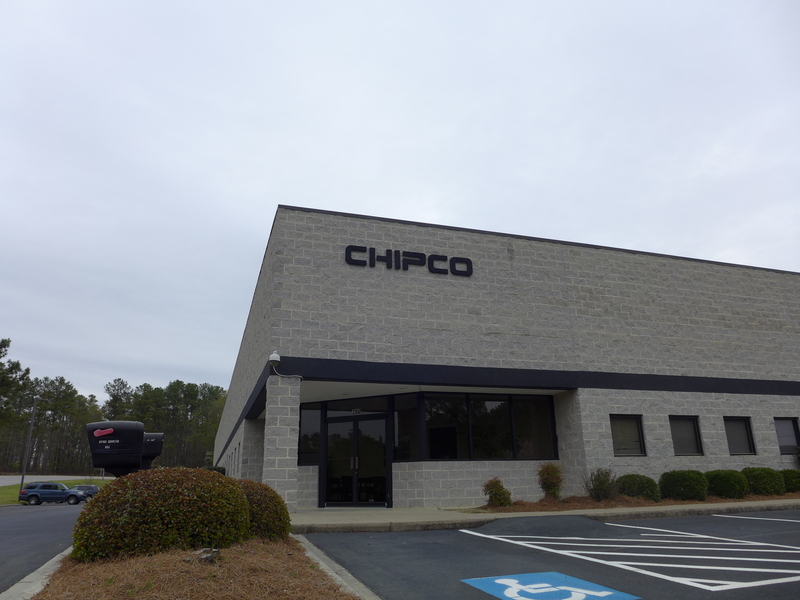 Chipco specializes in building a wide variety of desktop computers for just about any application. 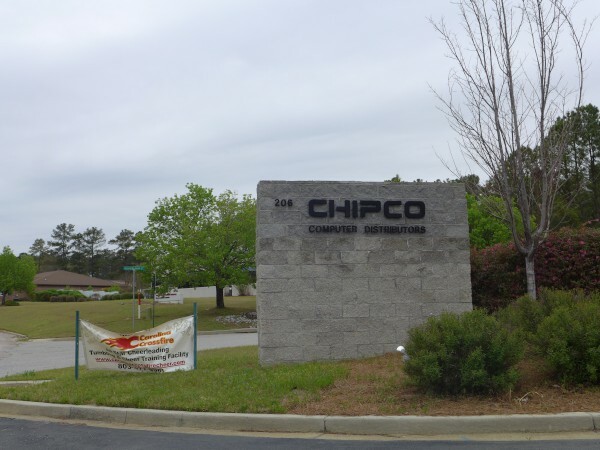 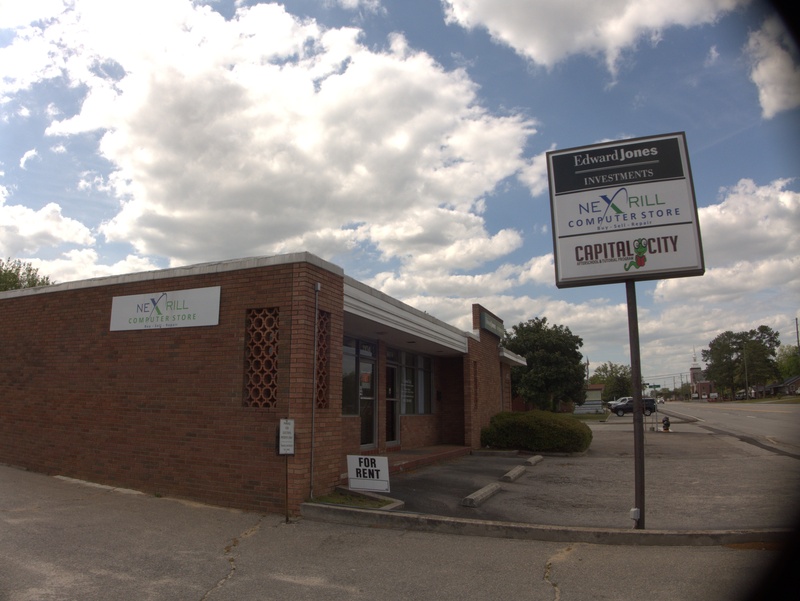 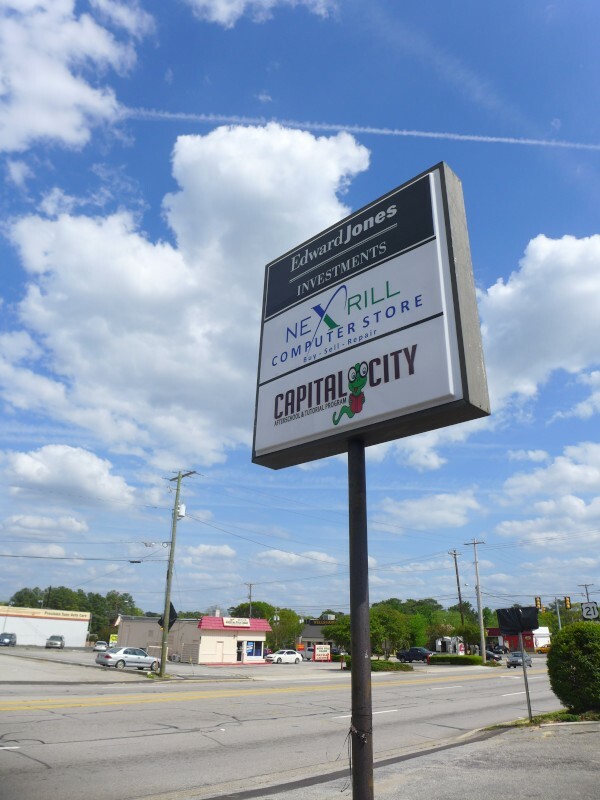 Columbia has had more tech companies than you might expect, back at least to the days when NCR was building innovative systems in West Columbia. 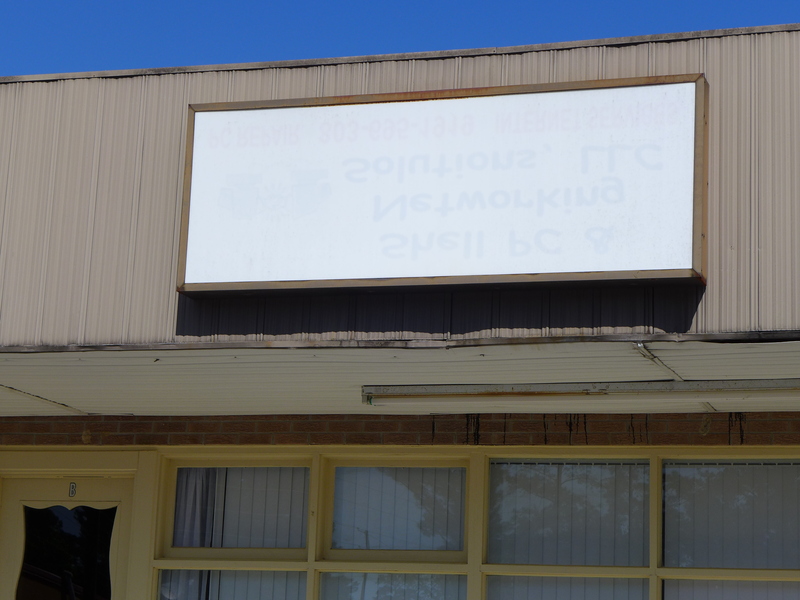 Still, I was unaware of this distributor, nestled with a cheerleading academy in a business park off of Farrow Road. 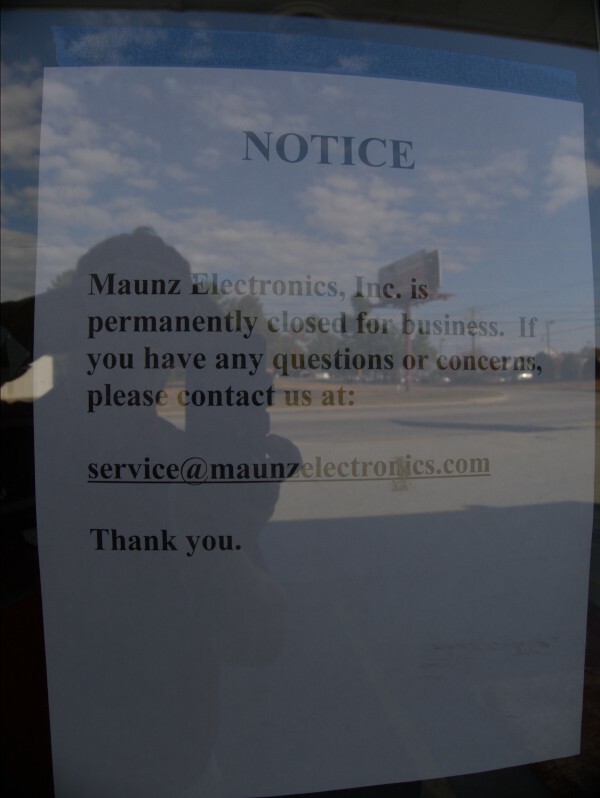 I'm not sure exactly when they closed, but given that it was just in Have Your Say and that we recently turned a month over, I suspect it was the end of March. Once upon a time, computers were magical devices, "Electronic Brains", spoken of with tinges of awe and fear. 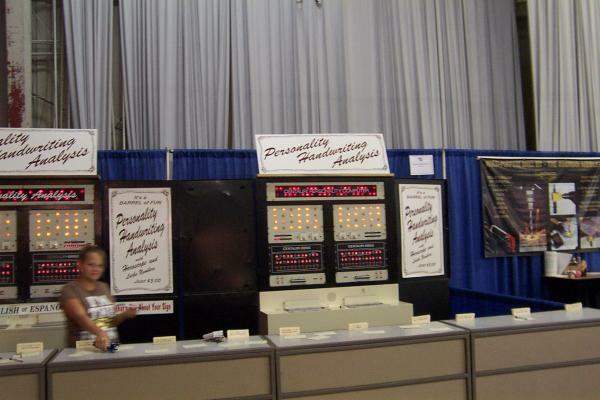 See for instance the classic Hepburn / Tracy movie Desk Set. 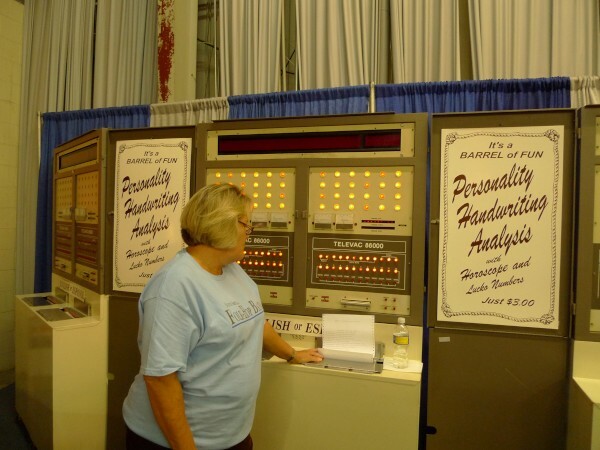 Nobody, in their day-to-day lives would expect to see a computer, and few people had any idea what they actually looked like. 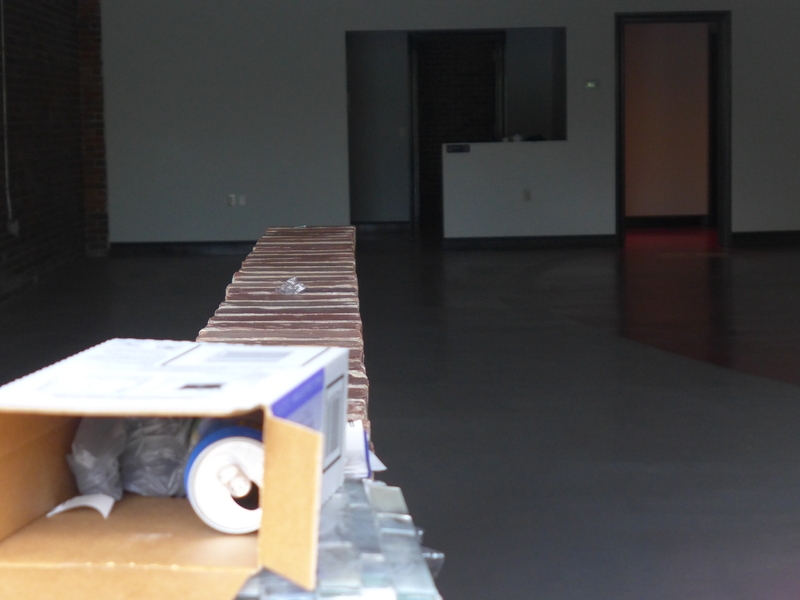 Everybody was sure, however, that they involved lots of blinking lights (and tape drives moving forever back and forth). 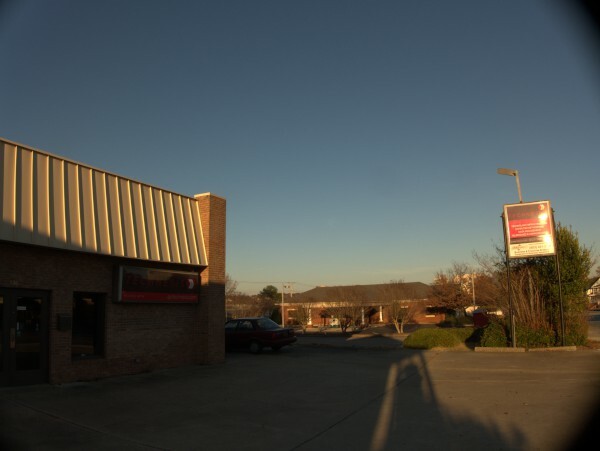 That first actually wasn't far from the truth. Early computers did have many lights, often signifying bits in various registers and program counters. 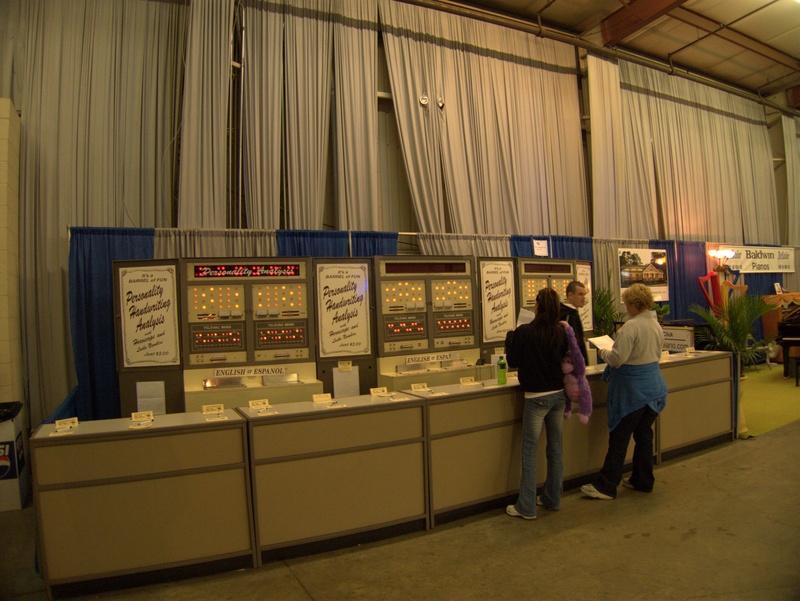 They also had toggle switches (like the much missed computer in the old Columbia Science Museum) for setting all those bits. 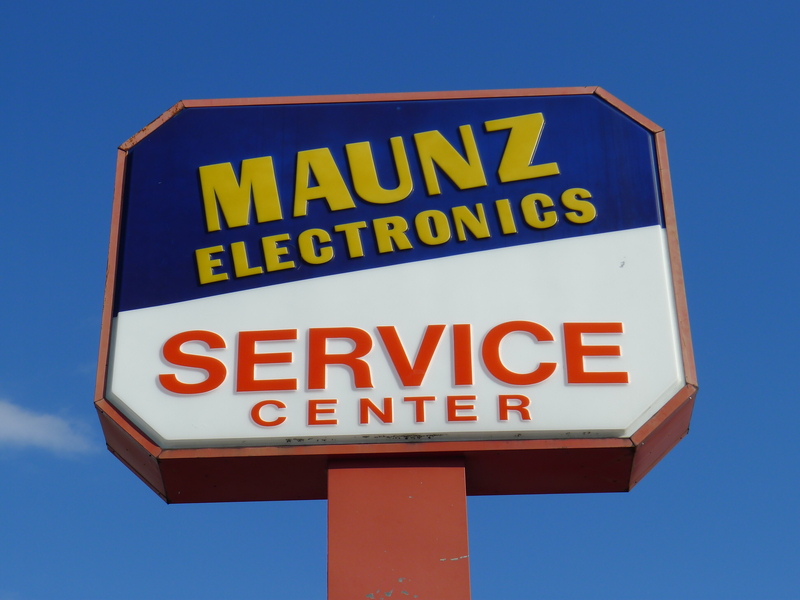 DAS KOMPUTERMASCHINE IST NICHT FÜR DER GEFINGERPOKEN UND MITTENGRABEN! 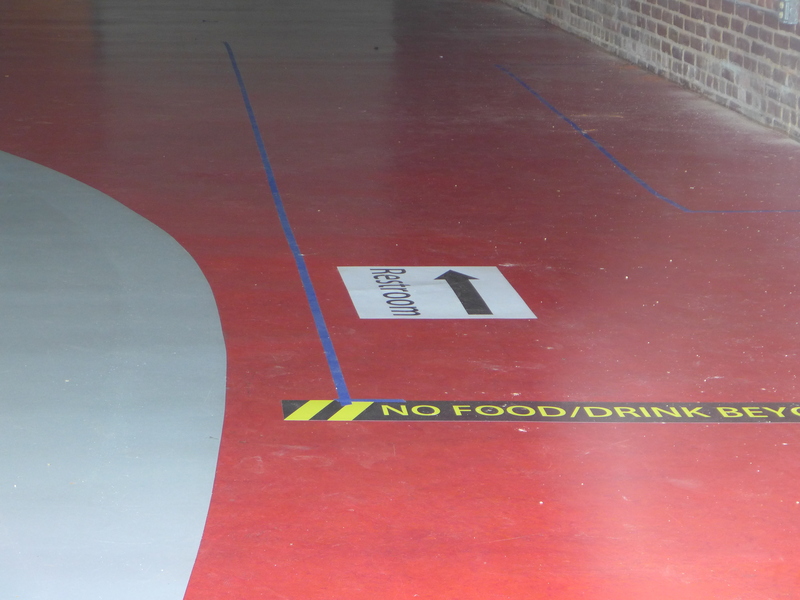 ODERWISE IST EASY TO SCHNAPPEN DER SPRINGENWERK, BLOWENFUSEN UND POPPENCORKEN MIT SPITZENSPARKSEN. 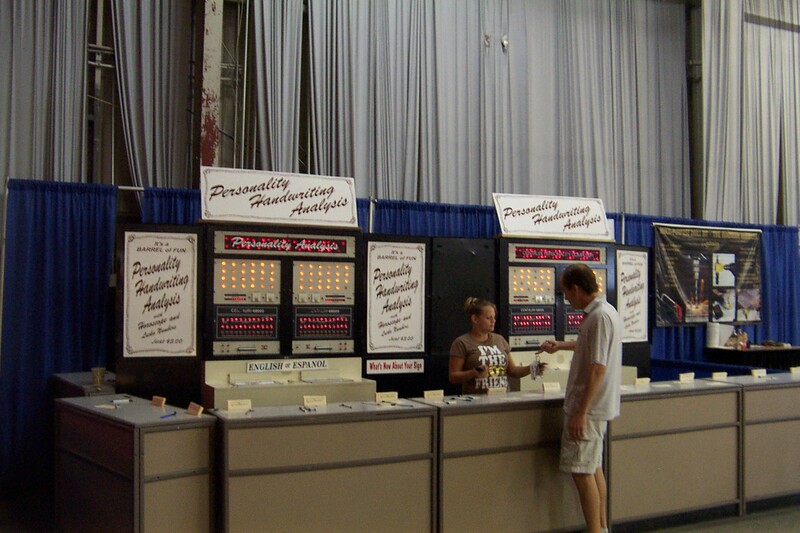 and the portmanteau word blinkenlights permanently entered the hacker lexicon. So people were interested, a bit awed and a bit scared by the idea of computers, and had only a very general idea of what they could do and how they looked. 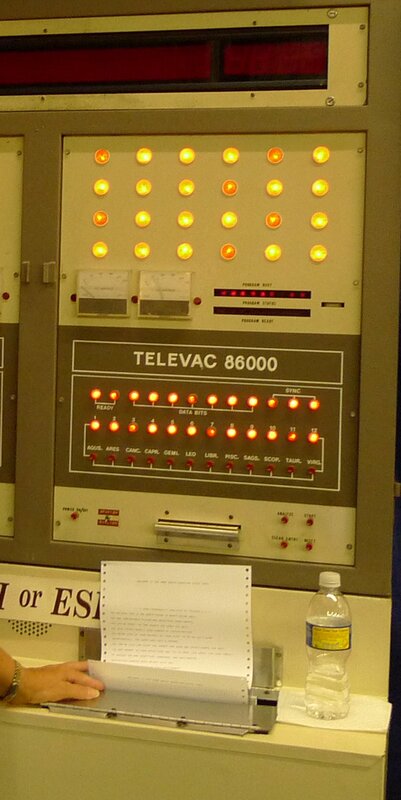 Thus: The TELEVAC 86000. This amiable faux computer has been making the rounds for as long as I can remember, which is to say, at least since 1965 or so, and probably prior to that. 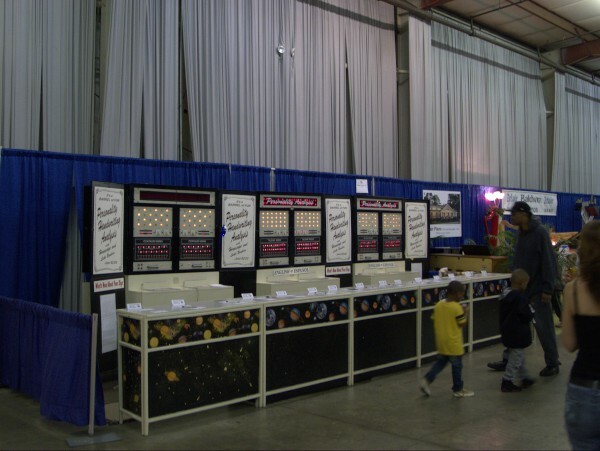 Every year, it would set up shop in the Steel Building or the Ruff Building and dazzle the passers by. 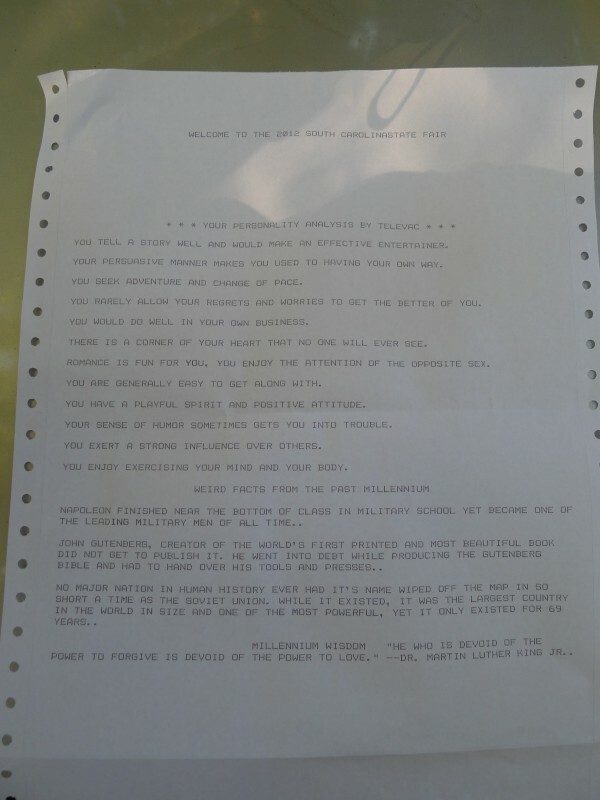 How could you possibly doubt a handwriting analysis from the TELEVAC 86000? IT'S A COMPUTER! IT'S SCIENCE! 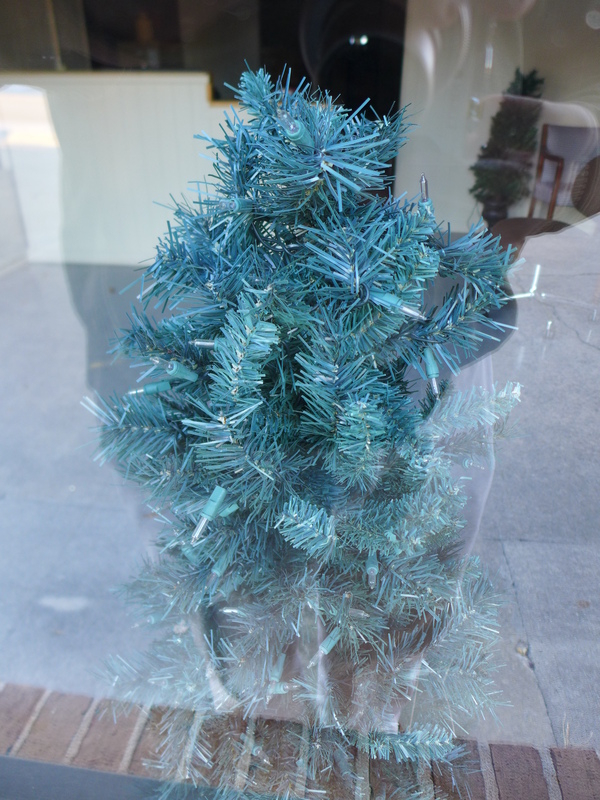 IT HAS BLINKING LIGHTS! 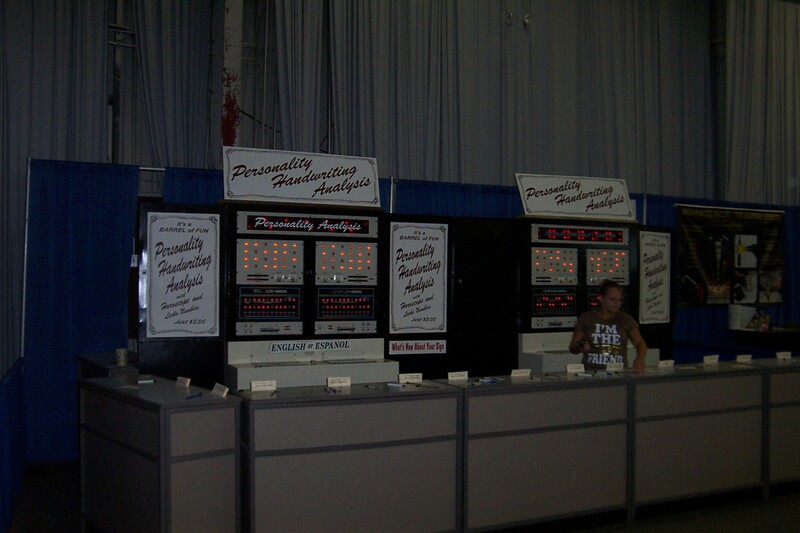 While we never did spring for the analysis when my parents took us to the fair back in the day, I have the feeling that at the time, this wonder of technology dispensed pre-printed cards dissecting your penmanship -- certainly there were no portable printers available for such a travelling roadshow. 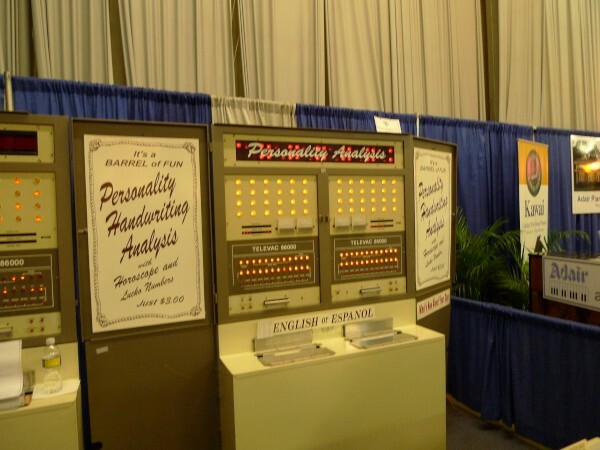 As the years went on, the TELEVAC did add a printer, and astrological predictions as well as handwriting analysis, but the basic blinkenlights front panel stayed fundamentally unaltered, even through the name change to the less antique sounding CENTAURI-68000. 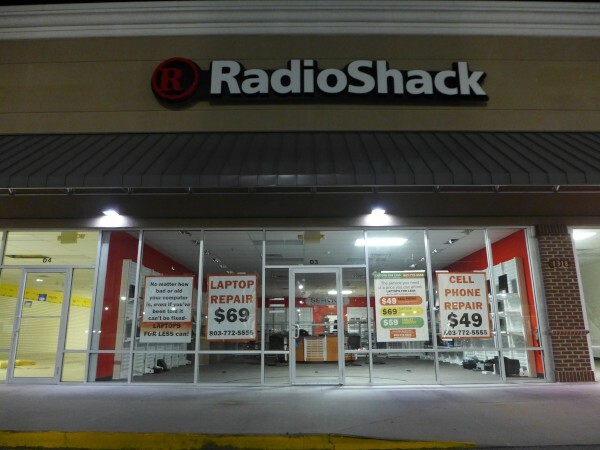 By the time I actually dropped $3.00 in 2012, the whole concept was not too credible. Whereas in 1965, nobody had seen a computer, much less had a computer, and the blinkenlights represented (to this 5 year old anyway) the apex of science, by 2012 most everybody (including lots of the 5 year olds) had a computer, and everybody knew what one looked like. 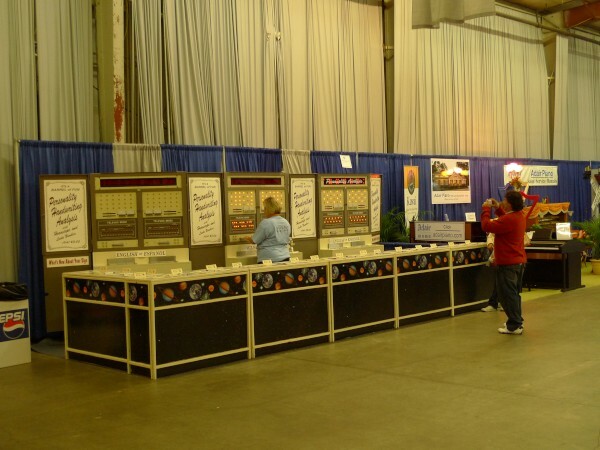 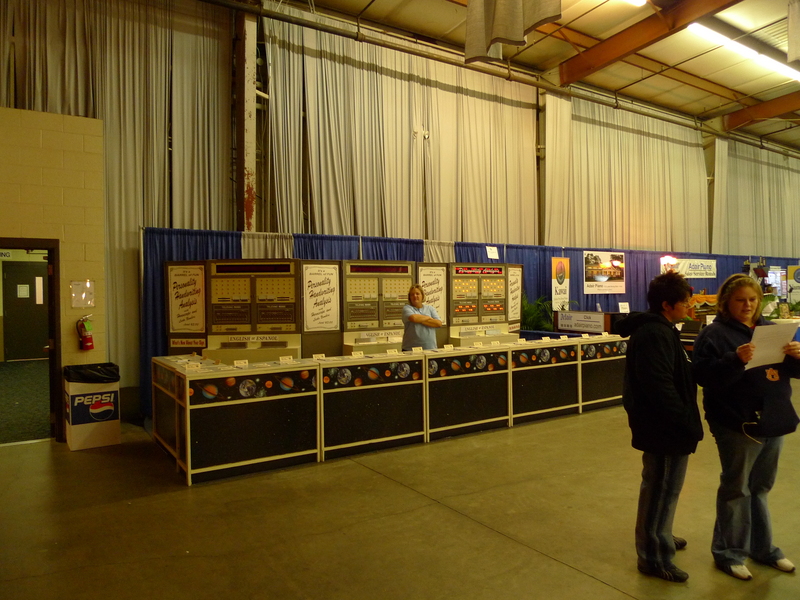 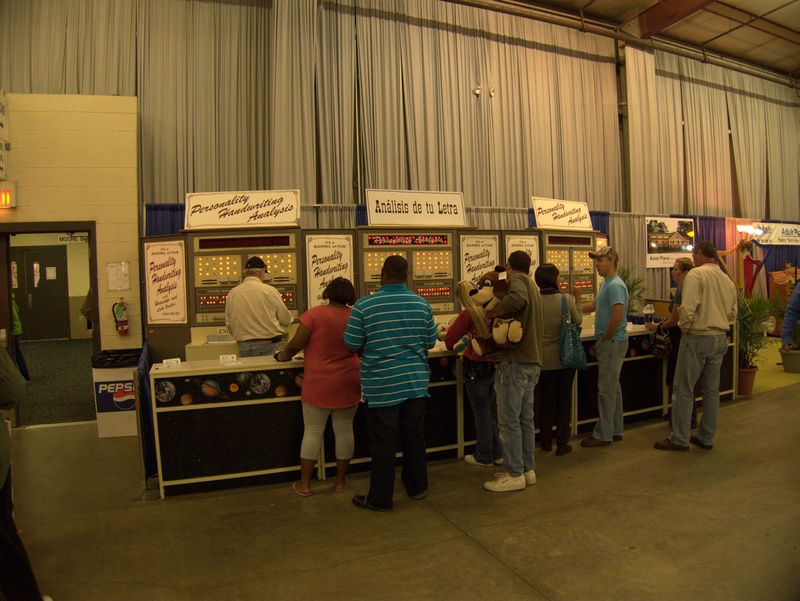 Sad to say, the TELEVAC / CENTAURI did not make an appearance at the 2013 State Fair, and I'm afraid it is the end of an era. 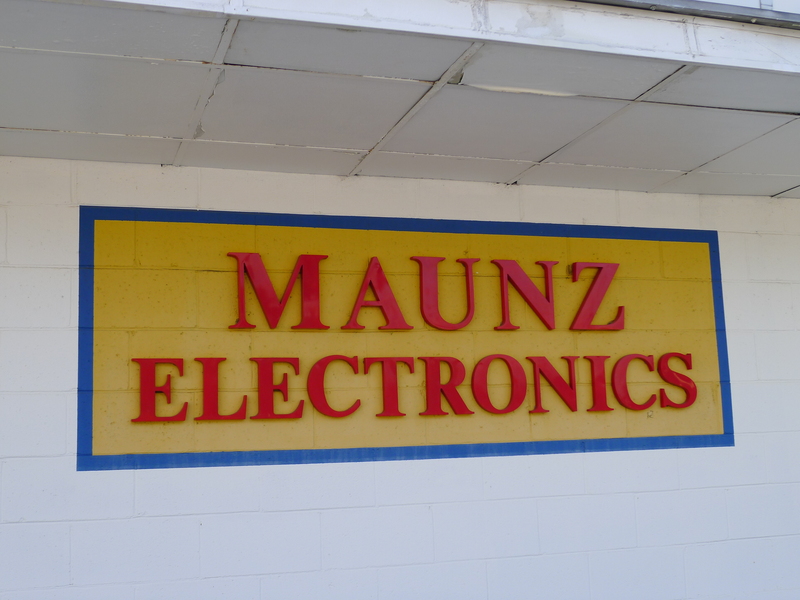 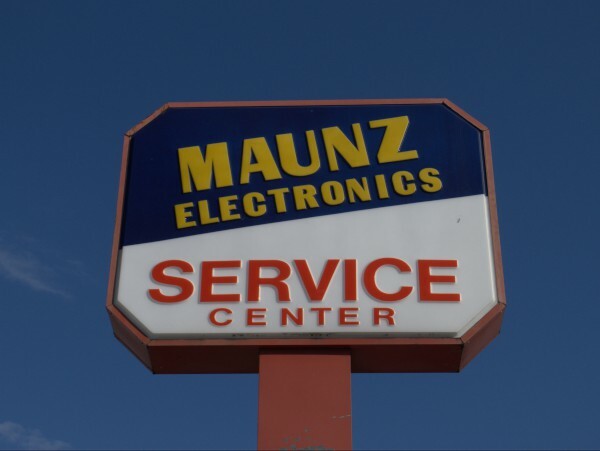 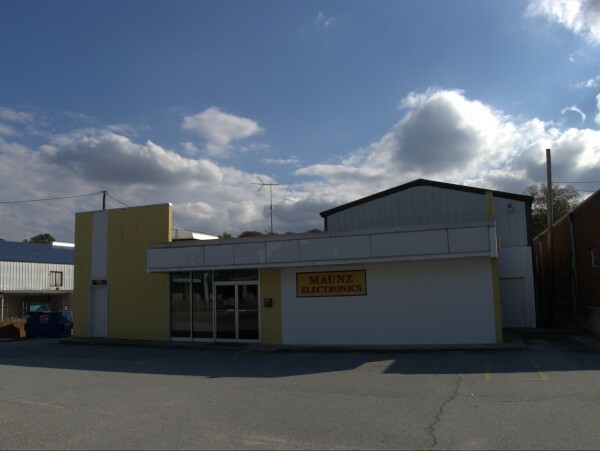 I've noticed Maunz Electronics off and on over the years as I drove down Sunset. 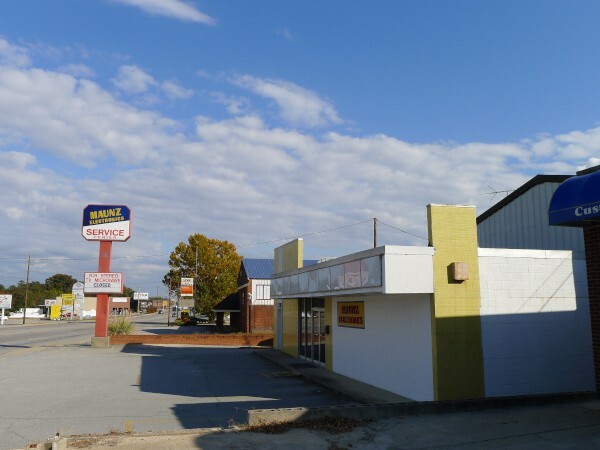 The building has some nice retro touches (which may have been current when it was built), and it would catch my eye, as would the strong blue of the roadside sign. The notices on the door list 12 October 2012 as the last day here, with the nice touch of referring people to another local business for future work.